LET’S MAKE SLEEP A THING FOR BABY! Becca's 2-Week Baby Sleep Training Plan in a downloadable, comprehensive, easy-reference format created using age appropriate strategies for baby. Hey! I’m Becca Campbell, and when my daughter refused to sleep at night, I bought some books, tried advice from others… not knowing if any were right for me. After working with families across America and internationally and being recommended by pediatricians, I found myself teaching and saying the same things every single day. So, I decided to write it all out and record it so that you don’t have to wait for a call or wonder if sleep is possible anymore! How does Sleep E-Coaching™ work? -Select and purchase your baby’s age appropriate plan! -Set up your personal user account to log-in and access the training sessions. -Receive automatic daily emails during 14 day plan implementation for FAQs, encouragement and guidance! -Enter into the program and begin watching/listening to each session within your baby’s plan! -Sleep E-Coaching™ comes with no support. Upgrade to Phone or On-Call Support to have my guidance! -Have Access to your program for months to come! 4-5 Months: 2 month of access. 6-16 Months: 4 month of access. -E-Coaching for 4 month olds is designed to help your baby sleep independently (bye bye pacifier and swaddle! ), have a full night of sleep (11-12 hours) with one night feed and create a consistent nap routine. There is no nap schedule for your baby until 6 months, so we expect to resolve baby’s day around awake times + naps totaling 3.5-4 hours of daytime sleep. -E-Coaching for 6-16 month olds is designed for babies who need to be sleeping 11-12 hours a night and have 2 - 3 hours of sleep each day (depending on nap transition). E-Coaching for 4 -5 Months: You’ll receive a personal user account to log-in and access the training sessions as much as you need for up to 1-months after purchase, after reviewing all sessions you will be prompted to select, “I’m Starting The Plan Tonight!” in which 14-daily emails will then be atomically sent to encourage, offer guidance and strategies for success! 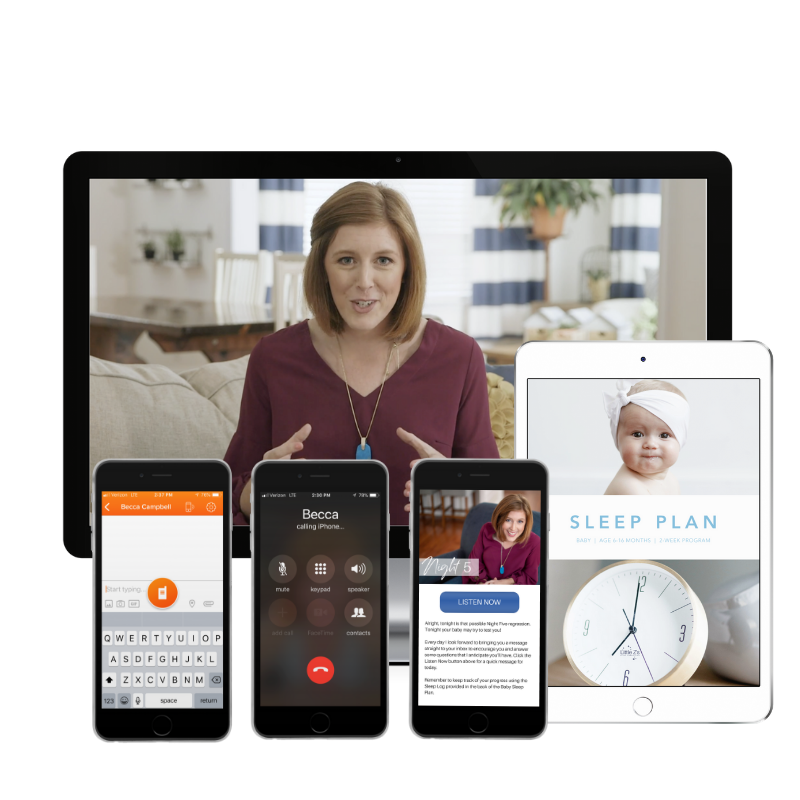 E-Coaching for 6-16 Months: You’ll receive a personal user account to log-in and access the training sessions as much as you need for up to 3-months after purchase, after reviewing all sessions you will be prompted to select, “I’m Starting The Plan Tonight!” in which 14-daily emails will then be atomically sent to encourage, offer guidance and strategies for success! All online programs have been designed to answer many of the questions I have faced after working with hundreds of families. Sleep E-Coaching does not include any support directly with Becca. If you’re looking for personal support with Becca, you can upgrade at any time to Email Support, Phone Support or On-Call Support. .
Will E-Coaching programs include crying? No parent enjoys listening to a baby cry, and I can never guarantee that crying won’t happen. Change is not welcome to babies, and they will vocalize the change with the only thing they know...crying! We will work through sleep training methods where crying will occur, but with a specific plan on how to respond. My biggest passion is that we are FAIR to your child. You need a plan to see success, and stop the inconsistencies every night. LISTEN TO PODCAST EPISODE 4: HOW LONG DO I LET MY BABY CRY? In short, the first few nights are the hardest. By Night 3 you need to be seeing the light, and not endless crying. If that’s happening…you’re not training correctly. Daily Schedule - Learn how to build a daily schedule while factoring in work and daycare routines. Understand age-appropriate awake times and when to cut off a nap. Naps - These are the hardest! Learn what to expect with naps, when to make a transition from 2-1, how to handle short naps, nap time routine, and much more! “Literally life-changing; Becca’s sleep consulting smoothly got our family functioning happily again! Our 8-month-old son had developed steady habits of waking up screaming 3-5x through the night, every night. He would only be soothed by nursing and didn’t always go back down. Naps were totally unpredictable. It.became.too.much. Becca holds you accountable to nap and nighttime steps that are easy to follow through with. All communication and resources through Becca were completely professional, kind and seamless. Lovingly and logically letting our child learn how to sleep fully and to his potential has been the best gift. Our son began sleeping through the night on his own within the first couple nights! Amazing. Consistent daily naps followed suit. Nearly two months after first contacting Becca now, sleep is no longer a worry or a dread in our household! Looking to work with Becca personally? 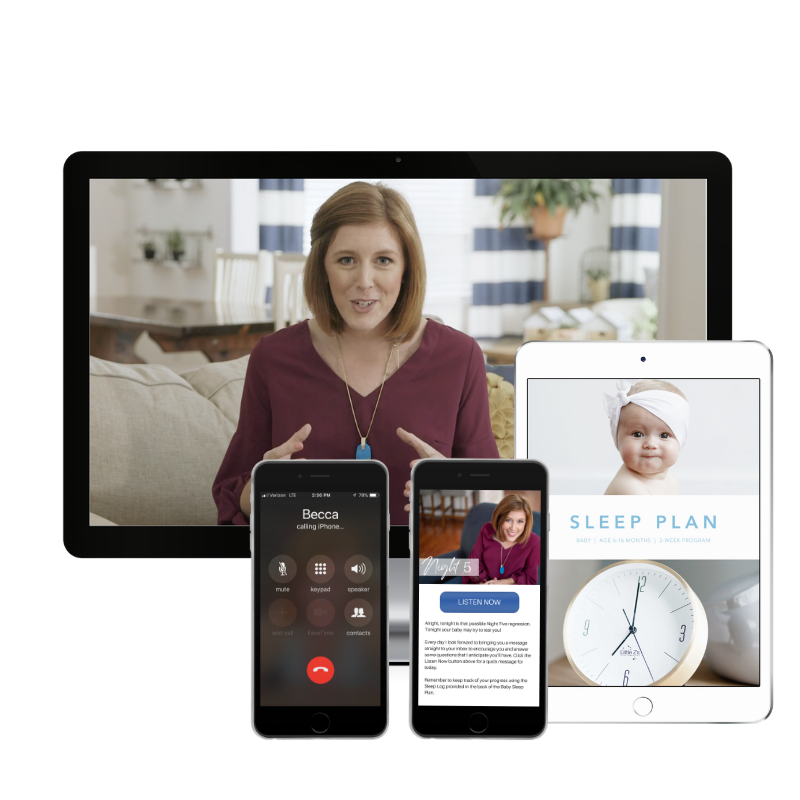 Upgrades to Phone or On-Call Support are available within the Sleep E-Coaching Program!